This set consists of six 5" x 7" prints: KOALA, KANGAROO, WOMBAT, PLATYPUS, EMU and CROCODILE. Unique, whimsical and minimal with a touch of retro, these prints will appeal to the young and the young-at-heart. 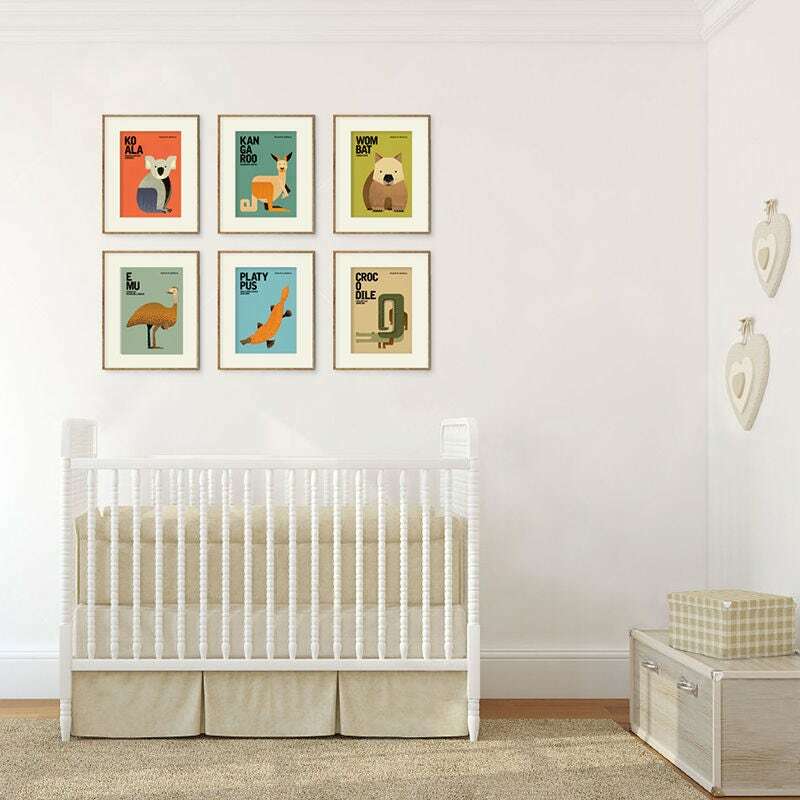 They are not only a perfect decoration for the children's room, baby nursery, home and office interiors but also an ideal gift for the animal lover in your life. Gift them as a complete set or separately — the choice is yours. 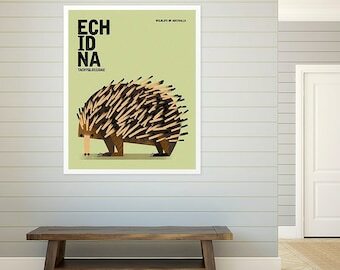 Wildlife of Australia is printed on fibre-based 285gsm Hahnemuhle Torchon, an acid-free, archival fine art paper of museum standard that lasts for centuries. A Torchon paper is one that is quite rigid and has a irregular texture, giving a feel of handmade quality to our print. Prints are supplied with a white border (about 5mm or 7/32") for protection as well as option of framing with a matt board. Frames, matt boards and any other objects shown in the photos are not included with the print. They are for illustrative purposes only and give examples of how beautiful the prints can look framed. Please note: Colours may vary from monitor to monitor. We try our best to match the images shown here to the actual print, but please allow for some variance due to this. Prints will be shipped in sturdy, moisture-resistant packaging via Australia Post regular air mail service, within 5 business days after receipt of payment. Delivery can take from 4 to 21 days. If you need your print(s) shipped via registered mail service or urgently, other arrangements can be made -- just contact us. Love the prints, prompt delivery. Would happily purchase from this seller again! Packed with care and promptly deliver - these beautiful prints will be terrific in our nursery! All major credit cards are accepted securely via PayPal or credit card checkout. Please make sure that your shipping and PayPal or credit card address match. We pack each order with great care and love; however, we cannot guarantee how it will be handled in the delivery process. In case the order arrives damaged, please contact us. It is of great importance to us that you receive your order as you expect it. If you are unhappy with your order for any reason, please notify us within 3 days of receipt. We accept returns within 7 days for UNDAMAGED and/or unused order. Shipping fees are not refundable. Return shipping shall be paid by buyers. We do not accept returns for buyer remorse. Your order will be shipped in sturdy, moisture-resistant packaging via Australia Post regular air mail service or Sendle door-to-door delivery service, within 5 business days after receipt of payment. Delivery can take from 4 to 10 days within Australia, and up to to 21 days everywhere else. If you need your order shipped via registered mail service or urgently, other arrangements can be made — just contact us. Please note that we are not responsible for extra fees at the customs, may they occur, when your order is being delivered. It is illegal to reproduce any design or content from this website. All our designs and artworks are our own and we are the only keeper of all rights. Sales of our works do not transfer copyright. Our designs and artworks are not allowed to be reproduced or altered in any way without specific written permission.